Our dōjō was established at the beginning of 2008 as Bujinkan Dōjō Prague 武神館道場プラハ. I founded it after I left Bujinkan Czech Dōjō – the first such club in Czech Republic, where I had participated as a student and instructor for many years. Although I happily look back to these times, I decided to go my own path with respect to my “student roots” and my vision how to continue. From a 2009 travel to Japan. In January 2008, I asked my former teacher for permission to establish my own dōjō and that is how Bujinkan Dōjō Prague was established as another subject that aims to spread this martial art in Czech Republic through various trainings, seminars and lectures. Since then, many of those interested in martial arts or Japanese culture have visited our events. We have visited many Japanese culture events as well to promote the traditional martial arts we train. I would point out participating at the 7th Japanese film festival Eiga-sai in 2014 where shinobi in cinematography was the main topic. 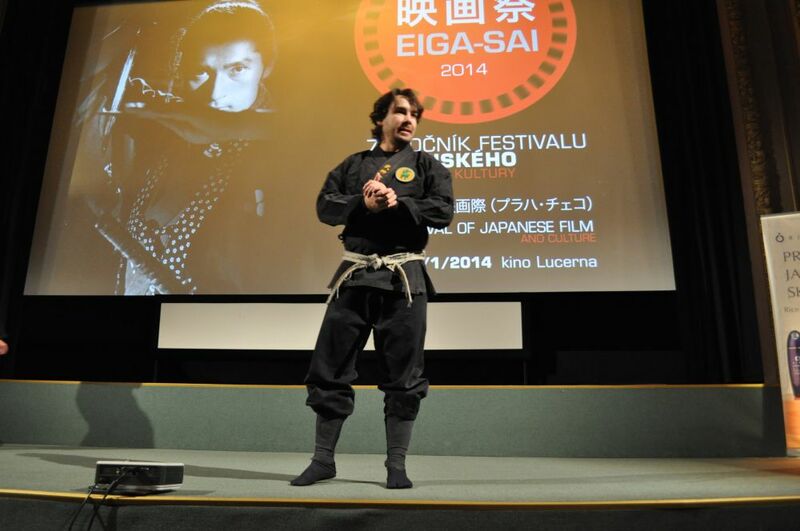 During this event, we had several public keiko – lessons in our dōjō, a lecture in Lucerna hall in Prague and we helped choose Japanese movies with ninjutsu topic for this festival. The main organizer of this event is Czech-Japanese association, which resides in Prague and has been promoting Japanese culture for many years. 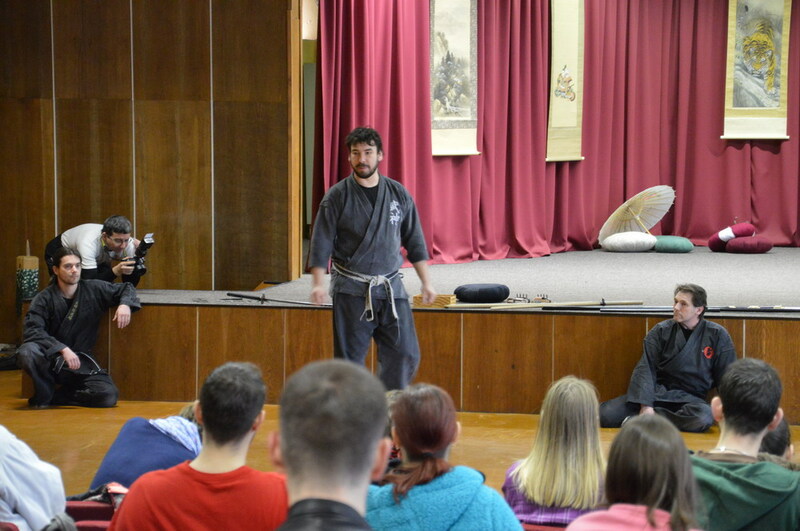 Another event was for example Nippon weekend in Košice in 2016, where we organized enbu 演武 – performance with lecture about shinobi and ninjutsu. This event was held by Cassovia Samurai organization. From performance at 7th Eiga-sai festival in 2014 at Lucerna, Prague. From performance at Nippon weekend in 2016 in Košice, Slovakia. Despite all of that, our main goal is to train/study bujinkan bugei武神館武芸 martial arts. We organize weekend training sessions on regular basis, often led by some of the most experienced foreign teachers. Amongst those who came to share their knowledge were for example shihans Sveneric Bogsäter and Mariette van der Vliet from Netherlands, Holger Kunzmann from Germany, Andrej Jasenc from Slovenia, Kacem Zoughari from France/Japan and others. From a Sveneric Bogsäter’s seminar in 2015. Currently our Prague dōjō has several branches outside of Prague and in Slovakia. Regular training sessions are held in Prague, Cheb, Vlašim, and in Košice, Slovakia. Dōjō in Livorno, Italy is also under our patronage. From a seminar in Livorno, Italy in 2011. If you are interested in learning more about us, you can look into our photogallery, where you can find various reports about our activities. Joint photo taken during Ishizuka sensei and Andrej Jasenc visit to our Prague dōjō in 2015. The visit of this teacher was a great honor for our dōjō.